While previous studies have linked high consumption of fruits and vegetables with lower stroke risk, the researchers’ prospective work is the first to examine associations of fruits and vegetable colour groups with stroke. The colour of the edible portion of fruits and vegetables reflects the presence of beneficial phytochemicals such as carotenoids and flavonoids. Researchers examined the link between fruits and vegetable colour group consumption with 10-year stroke incidence in a population-based study of 20,069 adults, with an average age of 41. The participants were free of cardiovascular diseases at the start of the study and completed a 178-item food frequency questionnaire for the previous year. White, of which 55 percent were apples and pears During 10 years of follow-up, 233 strokes were documented. Green, orange/yellow and red/purple fruits and vegetables weren’t related to stroke. However, the risk of stroke incidence was 52 percent lower for people with a high intake of white fruits and vegetables compared to people with a low intake. Each 25-gram per day increase in white fruits and vegetable consumption was associated with a 9 percent lower risk of stroke. An average apple is 120 grams. “To prevent stroke, it may be useful to consume considerable amounts of white fruits and vegetables,” said Linda M. Oude Griep, M.Sc., lead author of the study and a postdoctoral fellow in human nutrition at Wageningen University in the Netherlands. “For example, eating one apple a day is an easy way to increase white fruits and vegetable intake. 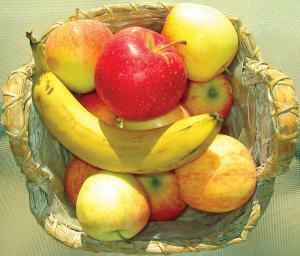 Apples and pears are high in dietary fibre and a flavonoid called quercetin. In the study, other foods in the white category were bananas, cauliflower, chicory and cucumber. Potatoes were classified as a starch. Previous research on the preventive health benefits of fruits and vegetables focused on the food’s unique nutritional value and characteristics, such as the edible part of the plant, colour, botanical family and its ability to provide antioxidants.